The stunning coastline continues as we make the relatively short bus journey to Kotor, Montenegro. The roads meander around the Gulf of Kotor a submerged river canyon dwarfed by overhanging limestone hills and mountains. The town of Kotor is located in the most secluded part of this natural harbour and although the old town is much smaller than its Croatian neighbours the engineering of the fortress is little short of impressive. If you make the climb to the top then a few words of advice. Firstly be prepared to pay 3 euros for the privilege. A local man will suddenly approach you asking for the fee but I assure you he is not trying to get beer money (although that would be a good idea…..) and it is legitimate. If it’s warm out take plenty of water. Pretty obvious I know but again there are locals at the top willing to charge over the odds for water. So a few tourist must have made that mistake. If walking the route in the summer go in the morning or evening and not at 14:00 like we did. Jono was fine but I was sweating more than a nun in a field of cucumbers. Finally at the top there is a small gap through the wall called the “secret window”. It’s signposted so not much of a secret but if you feel the inclination you can climb through the window and follow a rough track. The sheltered valley doesn’t offer you a view of the town but there are additional hiking tracks that the goat herders follow and an old chapel. 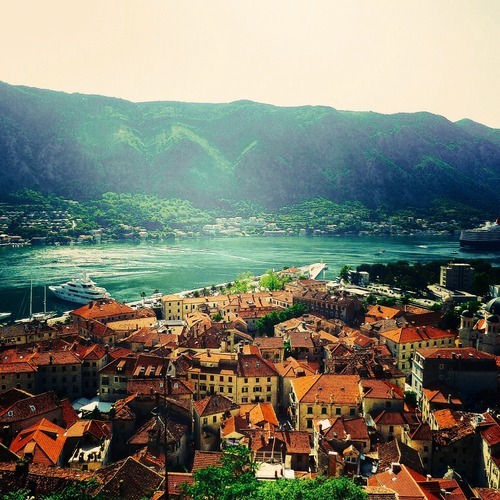 The “Old Town Hostel” was a great base to see all the sights and the majority of backpackers in Kotor stay there. The hostel staff were great and assist in arranging regular pub crawls, day trips and a very useful minibus to Tirana. Although I will advise avoiding the BBQ night. It was a great way to meet other travellers but the food was raw so many were left disappointed. On our second day we made the decision to take a day trip to Durmitor National Park. Montenegro’s largest UNESCO heritage site comprises of breathtaking canyons, mountains and plateaux’s. Tara gorge is 1300m deep making it deeper than the famous Grand Canyon. The bridge that spans it was destroyed in WW2 to halt the Nazi advance and rebuilt. If your feeling particularly crazy Europe’s longest zip line covers the gorge. The trip was a great break from the warmer coast and allowed us to see a large area of this beautiful country. 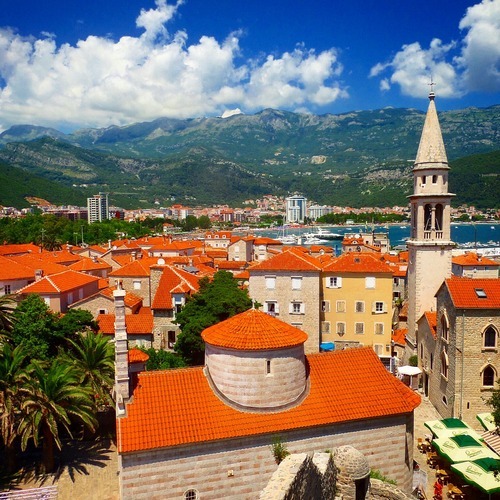 Budva was our second Montenegrin destination. We decided to stay four nights as we wanted rest bite and a place to plan our future progress to Albania and Kosovo. Budva has a very nice old town with plenty of eateries and bars, however unlike other destinations along the coast it has a reputation as Montenegro’s main party resort. The aptly named “Montenegro Hostel” was our home from home and we were extremely lucky with the travellers we met in “Yellow Dorm”. Alastair’, Nick, Anna, Maria, Dina, Larry (Yellow Dorm) and crazy Aussies Cameron, Tim and Mat (I’m sure I’ve missed some so sorry) you guys were the best and I hope my referee anecdotes didn’t annoy you too much. Unbeknown to us Budva is kind of Russia’s equivalent of Magaluf with many people descending on the town. This was a blessing to us as now thanks to the patience of Dina, Anna and Maria we now know a few Russian phrases so Spasibo and Dobryj den. The main strip has many clubs and bars but if your looking for a night long party your going to be disappointed if here in June. Until the peak season starts in July all clubs and bars in and around the old town close at 1am. As with Kotor the “Montenegro Hostel” also provides a minibus transfer to Tirana. This is by far the best option to get to Albania. The public bus routes are indirect and you have to grab a taxi for a few miles towards the boarder. We therefore took the easy option and headed to Tirana.